Tailgate Alaska is pleased to announce the Tailgate Alaska X Dupraz Ski Design Contest where entries will design the next graphic for the award winning Dupraz D2 skis. The top three graphics, according to online votes, will move onto a final, on January 26th, 2014, where a panel of Tailgate Alaska and Dupraz staff members will decide which graphic to produce. 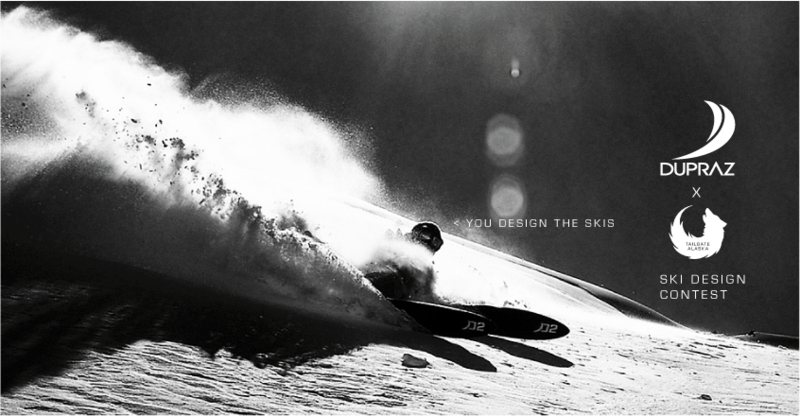 On January 29th, we will announce the winner of the Tailgate Alaska X Dupraz Ski Design Contest. The winner of the contest will get one of the limited edition boards and a ticket to Tailgate Alaska. The contest can be followed on facebook at http://facebook.com/tailgateak Tickets to the seventh annual Tailgate Alaska, March 28- April 6, 2014 are available now online. With 7 countries, six provinces and 14 states already representing, the event is the annual pilgrimage of dedicated recreational riders, professional athletes and the industry to ride the world’s best mountains and deepest snow on the planet. Tickets have been selling rapidly and are expected to sell out shortly. Among other benefits, Tailgate Alaska offers multiple on-site rescue teams and free daily snow science classes. This year Tailgate Alaska will add nightly seminars given by industry veterans and snow safety experts, who will share their experience with participants of the event. Tailgate Alaska tickets are available now at worldfreeridefestival.com For more information, check out http://www.tailgatealaska.com or contact mark@tailgatealaska.com. Had I known about this earlier I would have bought a Double VIP pass. I know its late.. But is there anyone who wants to go? If not. I'm definitely planning for next year!